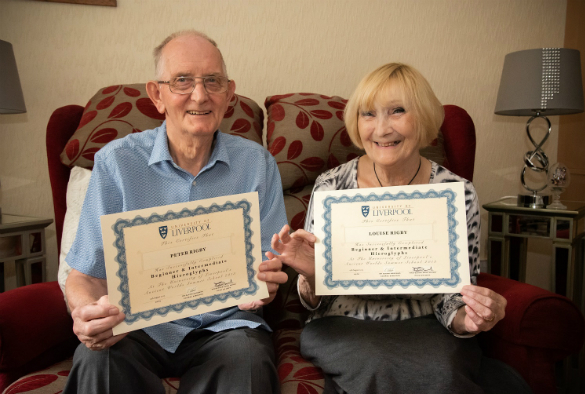 A Merseyside couple have become two of the oldest students to graduate from the University’s lifelong learning programmes. Proving it’s never too late to learn a new skill, husband and wife Peter, 80, and Louise Rigby, 76, from Bromborough, Wirral, have completed a series of Egypotology courses over the past 16 years, including learning hieroglyphs. The pair, who have 16 great-grandchildren between them, met through their passion for Egyptology and have become two of the University’s most popular students. Despite being a generation older than even the most mature students on the courses, the couple have struck up friendships with students and lecturers, even joining them for nights out at the famous Philharmonic Dining Rooms pub. Peter and Louise have been married since 2004, having met through attending classes and workshops on Egyptology at a time when they had both recently been widowed. Fast forward fourteen years and the couple are stronger than ever and inspiring fellow residents at Alpha Living’s Oakland development in Bromborough with their active approach to life and learning. Peter said: “Quite often we get dragged to the pub with the students. It’s always great fun. There are around 30 of us and we’re by far the oldest. I think they see us as parental figures which we don’t mind. Academic Director of Continuing Education, Dr Glenn Godenho from the Department of Archaeology, Classics and Egyptology said: "It’s been a privilege to have Louise and Peter in our courses, workshops and seminars over the years. Their passion for learning is utterly inspiring and their enthusiasm is highly contagious. Through our community engagement programme, Louise and Peter have become core members of our University’s academic community, and prove that it’s never too late to learn with us."